Mahindra Gusto prices start at Rs. 48,615 (Ex-Showroom) and the top end variant Mahindra Gusto VX is priced at Rs. 53,030 (Ex-Showroom). Mahindra Gusto is available in 3 variants and 6 colours. The claimed ARAI mileage for the Mahindra Gusto petrol is 63 kmpl. Q. Which is best between Activa 5G and Mahindra Gusto? Q. What is the fuel tank and reserve tank capacity for Gusto scooter? This feature is not available in gusto.It has only 6lit petrol tank. Q. How much is Whole engine repair cost? It can be too high as it is the heart of bike, as a heart surgery costs very high. Q. I have Mahindra Gusto, I want to know about engine capacity and service cost? Q. 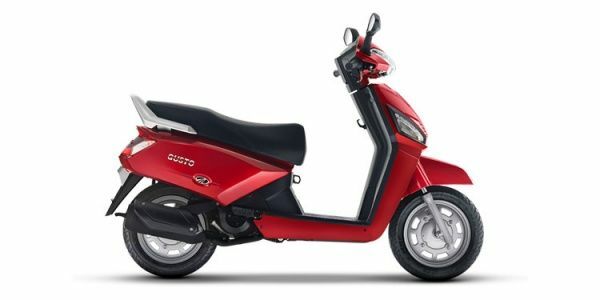 Which is a better option for both Men and Women Mahindra Gusto or Honda Activa 5G...?Please Suggest. Q. Is Gusto in diesel also?? It is not available in diesel. The Mahindra Gusto makes a curious case for itself in the Indian scooter market with its indigenous features, refined powerplant, comfortable ride quality and a fuel efficient motor though after sales remains a concern. Overall it is a decent scooty for indian conditions.